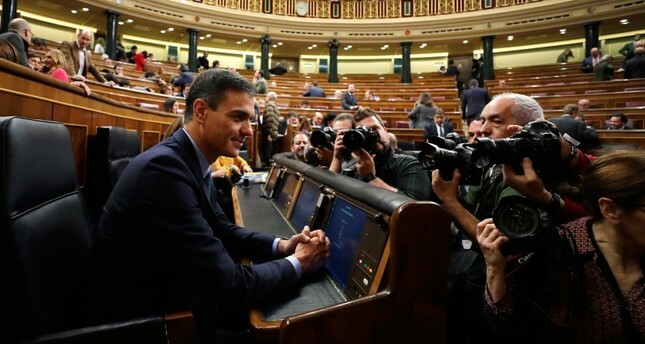 Catalan separatist and right-wing lawmakers in the Spanish parliament's lower house rejected Wednesday the ruling Socialist government's 2019 budget plan, likely paving the way for a call of early elections by Prime Minister Pedro Sanchez. Opposition leader Pablo Casado, head of the conservative People's Party, said Wednesday's vote was "a de facto confidence vote against Pedro Sanchez." The six blanket objections put forward by various parties received the backing of 191 lawmakers, meaning the government would in theory have to re-examine its budget and present a new, revised version. In the current context, though, with Sanchez left with so little parliamentary support, analysts predict he will call early general elections. "Legally he is not obliged to do so," said Antonio Barroso, deputy research director at the Teneo Intelligence analysis group. "But politically, the question is whether the government would be justified (in not calling polls)." Catalan deputies from pro-independence parties had demanded to open talks on the northeastern region's self-determination in exchange for supporting Sanchez's spending proposal, but the center-left minority government had rejected that. The socialist party holds only 84 seats in the 350-seat lower house. Its votes and those of the anti-austerity Podemos party weren't enough to counter a majority of center-right, conservative and smaller parties voting in favor of objections. Without parliamentary support, Sanchez's government can't pass significant legislation and would need to prolong Rajoy's 2018 spending plan. That leaves the center-left administration without funds for social policies that are key to retaining Podemos' support. Sanchez rushed out of the lower house's chamber shortly after the vote, dodging questions by reporters. His finance minister, Maria Jesus Montero, said that it made sense that Sanchez's term, which ends next year, would be shortened with the budget rejection — but that it was up to the prime minister himself to decide if and when to call a new general election. Talks between Sanchez's government and a new separatist coalition that took power in Catalonia after 2017's failed independence push broke down last week when the government refused to accept self-determination talks. The politically charged trial entered its second day on Wednesday with the Supreme Court prosecutor criticizing what he said were defense lawyers' attempts to turn the proceedings into an examination of the Spanish state and judiciary. Prosecutor Javier Zaragoza called "ridiculous" and "unjustified" the arguments made on Tuesday, the trial's opening day, by defense lawyers who called the case politically motivated and an attempt to eliminate dissent in the troubled northeastern region.